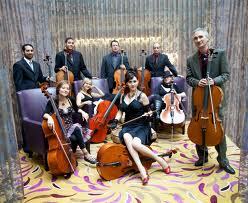 Tune in for the Portland Cello Project live in-Studio 2A this Thursday at 4pm on The Home Stretch. PCP are in Tucson performing at Solar Culture with the Alialujah Choir for an early, all-ages show at 8pm.Portland Cello Project have just released their recording of Beck's sheet music-only album, Beck Hansen's Song Reader, with instrumentation ranging from simple and beautiful to orchestral and epic. They're joined by friends, collaborators and fellow Portlanders Alialujah Choir, an indie folk trio featuring members of Weinland, Norfolk & Western and M. Ward.